Windows Live Hotmail formerly called Hotmail is one of the most popular free online email, provided by Microsoft. Hotmail (now Outlook), is a web-based email service and users can access Hotmail from a Web browser anywhere in the world. Hotmail was launched in 1996 and was the first free web-based email service. Originally spelled HoTMaiL, putting emphasis on the “HTML”. Microsoft later acquired the service in 1997 and the service was renamed to Outlook in August 2012. Now a days, Outlook services provides unlimited storage for free, connections to Skype, Facebook, Twitter, Google and LinkedIn, mobile access, spam filtering, and more. Of course, you can also use Outlook to send and receive emails. Hotmail is an easy way to get a free email address that can be accessed anywhere. Hotmail has the advantage of being fast, free, and it equipped with some great features which include a robust anti-virus, proven anti-spam system and anti-phishing features. Once you’ve read our article, which includes a helpful link to Hotmail itself, you’ll be able to sign up for your own free email account in just minutes. Without further ado, let’s talk about the simple, step-by-step process that you will need to follow. We’ve divided the whole process into four simple steps. It’s really easy to follow them and we’ve made sure that our instructions are clear and simple for everyone to understand. We want to make things easier for you! To create a Hotmail account (@hotmail.com), simply click here: signup.live.com. On-screen instructions will appear to set up your account. Microsoft will request personal information as listed below. You can use your existing email address associated with any other email service provider, i.e., someone@gmail.com, someone@yahoo.com. If you don’t have email before, you can click on the “Create one” link. It is not necessary to fill in all the fields. However, if you forget password or lose access to your account, some information can be useful to recover it. Choosing Your Hotmail Password. The requirement for the password is to have a minimum of 8-character, and it is case sensitive i.e., if your password is “aT123Dd”, you cannot login to your account typing your password as “at123dd”. When choosing your password, it is recommended to combine capital and lowercase letters, numbers, and special characters (!@#$). We recommend writing down the password on a piece of paper, as well as saving it to a digital file. Make sure that you have virus and malware protection in order to ensure that hackers can’t access your new password. Better safe than sorry. Alternate email address (Here you were to provide an address associated with another email provider, your password reset information will send to the email in case you forgot your Hotmail password. Captcha Verification: It is also an important phase. It is to confirm that the account is not creating by a bot. You will need to type the characters show up in the image in the field below it; you can choose an audio version of captcha if you cannot see the text on the picture properly. After you do so, hit the “create account” button. If you’ve missed any mandatory fields, the system will not let you process your account. The fields that you missed will be indicated with a red asterix, so it will be easy to find any problems and fix them. 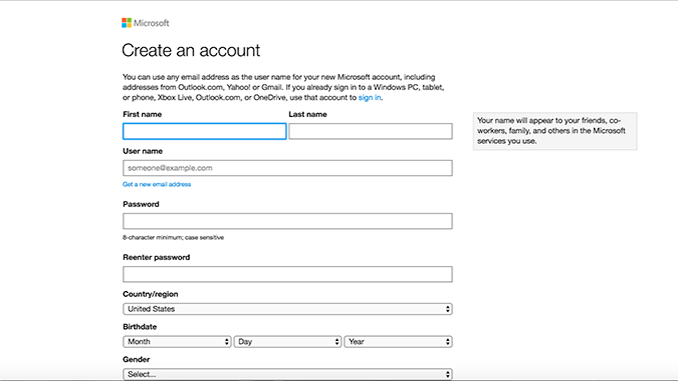 Once your Hotmail account has been created, test that you can login with your new username and password by going to the login.live.com homepage. 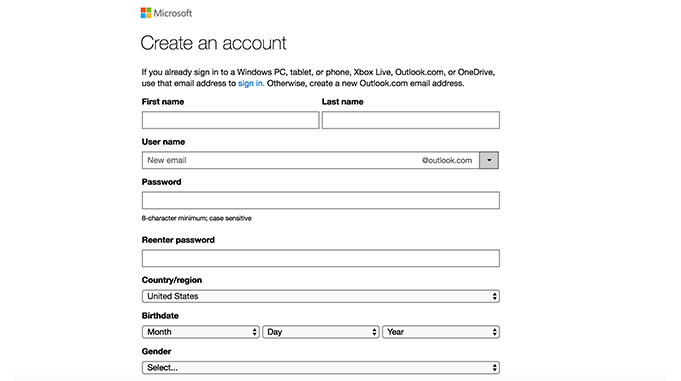 As you can see, it’s really easy to sign up for Hotmail and we recommend doing so right away. Hotmail is a great way to send and receive email online, without spending a single penny. Once you’re inside of Hotmail, you’ll have lots of options. You’ll have the power to create Contacts lists, send email, create a design for your Inbox and so much more. You’ll also be to save or delete messages. There are tons of features to check out and they are well worth looking at. Some people use Hotmail for personal email and others use it for business. Some use it for both. It’s a versatile interface which is designed to serve the needs of people all over the world and it’s the kind of quality interface that Microsoft is known for producing. 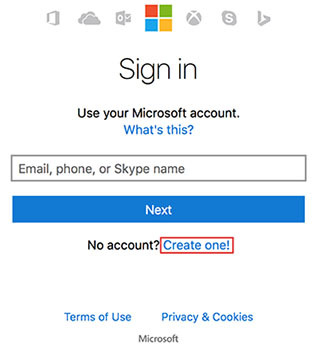 Now that you know the drill, why not Hotmail sign up right now? Doing so will give you the power to unleash the potential of Hotmail. Whether it’s your first email account or your hundredth, you’ll find that Hotmail provides exceptional services for free, and it’s far superior to a lot of free email interfaces out there.